We report for the first time the nitrogen doping of reduced graphene oxide (rGO) and TiO2 nanowires (NWs) when TiO2 NWs intercalated rGO membranes were immersed in ammonia aqueous solution under 8 W 254 nm UV irradiation. Such nitrogen-doped rGO/TiO2 NWs photocatalytic membrane produced H2 at a rate of 208 μmol h−1 g−1 under 8 W 254 nm UV irradiation, which is more than 14 times higher than the yield of the TiO2-P25 and 30-fold higher than TiO2 NWs alone under the same condition. Our study demonstrates a new synthesis route for doping nitrogen in rGO and TiO2, as well as the preliminary feasibility of hydrogen extraction from ammonia-containing wastewater with such a low-cost recyclable photocatalyst. In addition, the study illustrates the complexity of photocatalysis of ammonia aqueous solution, which involves multiple reactions in concurrence. The water-energy nexus presents many opportunities for turning the waste into useful energy and transforming energy-consumers to energy-producers . Ammonia, one of the most abundant compounds in wastewater, is regarded as a harmful waste to the waterways, while nitrification of ammonia constitutes one of the most important processes in wastewater treatment. On the other hand, as a clean and renewable energy, hydrogen is one of the promising new replacements to traditional fossil fuels. However, it remains a challenge in finding a safe and efficient way to store and transport hydrogen. Storing hydrogen in chemicals that contain hydrogen element is an alternative solution, such as sodium borohydride, methanol, formic acid, and aqueous ammonia. Among these storage chemicals, only ammonia is carbon-free and simple-structured, which makes it easy to transport and is of low cost, particularly when being sourced from wastewater. To release H2 from ammonia, photocatalytic decomposition using TiO2 photocatalyst has been demonstrated, which directly converts ammonia to nitrogen and hydrogen [2, 3]. It is a salient advantage that photocatalytic hydrogen production from ammonia decomposition does not cause CO2 pollution. Many other advantages include simple process, safe storage and transportation, and low price. Therefore, producing H2 from ammonia has recently been put in the spotlight as a smart approach with economic benefits and broad application prospects. Titanium dioxide is so far the most widely studied and used semiconductor in photocatalysis, owing to its abundance, chemical stability, and mechanical robustness [4, 5]. However, the photocatalytic efficiency of TiO2 is limited by its high bandgap energy (3.2 eV for anatase) and high electron-hole recombination rate [6, 7]. Significant research efforts have been exerted to improve the performance of TiO2 by chemical doping [8, 9], material composition [10, 11], and coupling photonic structures [12, 13]. Moreover, since photocatalysis is a surface reaction, the morphology control of TiO2 either as nanoparticles or micro- mesoporous materials has been extensively researched [14, 15, 16]. Furthermore, when designing the TiO2 photocatalysts, we need to be mindful of the issue of photocatalyst recovery; it is desirable to be able to recover the photocatalyst without undergoing intensive separation procedures. 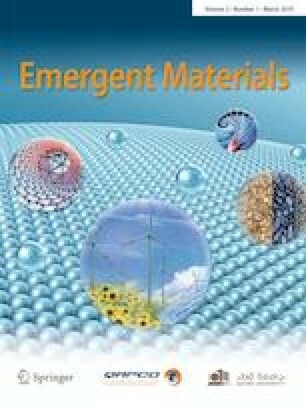 Various modification strategies have been investigated to increase the efficiency of TiO2 in NH3 photocatalytic decomposition for hydrogen production, for example, using porous perlite as the TiO2 photocatalyst support  and adding noble metals such as Pt , Pd , and Ag  as co-catalysts. Although addition of noble metals is effective in improving the reaction selectivity and hydrogen yield, the cost is too high for practical applications. Recent years have seen increased studies on the combination of TiO2 with reduced graphene oxide (rGO) for photocatalytic reactions [21, 22]. As a “miracle material” with extraordinary electro-conductivity, mechanical strength, and thermo-conductivity, graphene and rGO have received tremendous research interest [23, 24]. rGO has attracted significant attention in electronics, optics, and chemical processing, due to the maturing large-scale, low-cost production. Owing to its high conductivity, rGO has been used in conjunction with semiconducting nanomaterials in photocatalysis for suppressing electron-hole recombination, thereby increasing the photocatalytic efficiency [21, 25]. Though pure graphene does not exhibit catalytic functions on their own, rGOs with certain impurities or chemical doping by intention have been shown as effective photocatalysts or electrocatalysts . Nitrogen doping of graphene or rGO has attracted significant interest, since it results in a highly effective metal-free catalyst . However, most of the N-doping methods in graphene or rGO require high energy input, such as high temperature treatment, electrothermal, CVD, plasma and irradiation [6, 28, 29, 30, 31, 32, 33]. However in our study, the N-doping happened spontaneously in aqueous ammonia solution under low-power UV irradiation in room temperature (below 30 °C), and the hydrogen yield efficiency from ammonia solution has largely increased. Hereby, we are proposing a simple and green method to dope nitrogen on graphene. In this study, we have reported, for the first time, the combination of TiO2 nanowires (NWs) with rGO on the photocatalytic efficiency in producing H2 from aqueous ammonia solution. The novel photocatalyst was prepared by embedding TiO2 NWs in rGO membranes through a one-step filtration method. Higher H2 production was observed by combining TiO2 NWs with rGO in comparison to the unary systems of TiO2 NWs, Evonik P25 (commercial benchmark TiO2 photocatalytic nanopowders), and pure rGO, alone. Importantly, we discovered that the rGO was spontaneously doped with nitrogen under this low-power (8 W) UV irradiation at room temperature in ammonia solution, which appeared to be a key factor for its outstanding hydrogen yield efficiency. Graphene oxide (GO) was prepared via modified Hummers method, and TiO2 NWs were synthesized according to Zhang et al. . Certain amount of synthesized TiO2 NWs was added into the GO dispersion. After ultrasonication of the mixture for 30 min, the GO/TiO2 NWs composite thin film was assembled on a Mixed Cellulose Ester (MCE) membrane (ø = 47 mm, 0.22 μm) by vacuum filtration, which can be readily peeled off from the base MCE membrane. In order to remove those oxygen-containing groups and to make full use of graphene’s outstanding charge mobility, the GO/TiO2 NWs thin film was reduced by dipping into hydroiodic acid (HI) (55%) at 100 °C for 30 s. The reduced GO/TiO2 NWs thin film, denoted as rGO/TiO2 NWs thin film, was then rinsed by ethanol and DI water for several times followed by air drying. 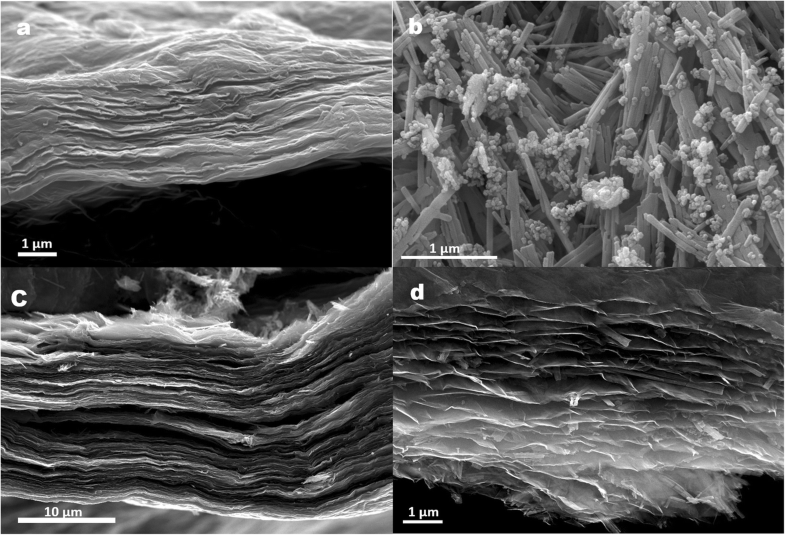 The morphologies of the as-synthesized nanomaterials were examined by a JEOL JSM-7100F field emission scanning electron microscopy (FESEM) at 15 kV. 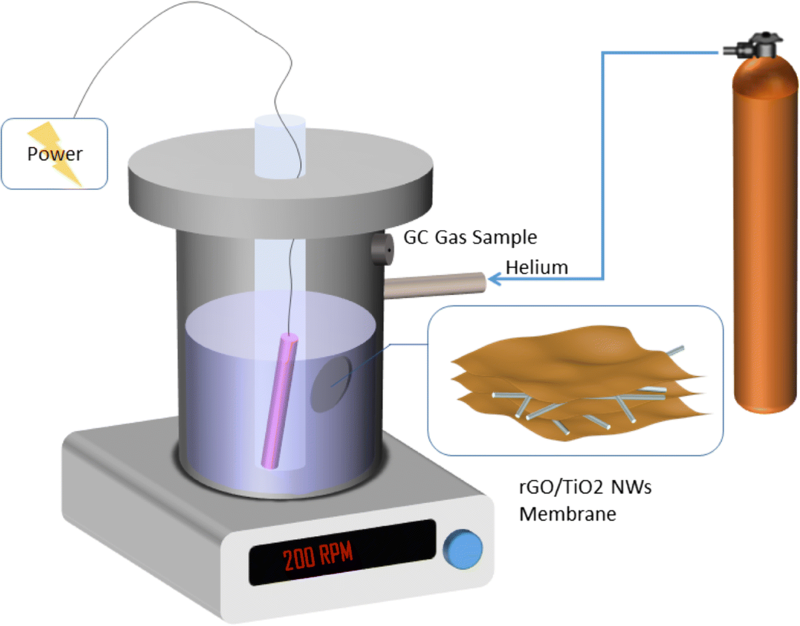 The chemical compositions of the rGO/TiO2 NWs membrane after being reacted in ammonia solution were acquired using a Kratos Axis ULTRA X-ray photoelectron spectrometer (XPS). Porosities of the membranes were determined by water intrusion method . The nitrogen adsorption and desorption isotherms were measured at the temperature of liquid nitrogen (77 K) using a TriStar II 3020 automated surface area and pore size analyzer. Prior to the measurement, samples were degassed at 150 °C overnight. The photocatalysts that were tested in this study are rGO/TiO2 NWs membranes, rGO membranes, TiO2 NWs, and TiO2-P25. The equipment of photocatalytic experiment was designed and built in the laboratory of the heterogeneous photocatalysis, VŠB-Technical University of Ostrava. The experimental apparatus consists of three units—gas supply, photoreactor, and analytical unit, as shown in Fig. 1. The reactor shell (length 16.5 cm, width 7 cm, volume 635 ml) was made of stainless steel and illuminated by UV 8 W Hg pen-ray lamp with a peak intensity at 254 nm (Ultra-Violet Products Inc., USA, 11SC-1) situated in the center of the quartz glass tube. The reactor was connected with a pressure probe (Greisinger, GMSD 3.5 BAE), and the pressure of the inner system was measured by a digital manometer (Greisinger, GMH 3110). All the threads were sealed by Teflon tape. At the beginning of photocatalytic decomposition of ammonia, 100 ml aqueous ammonia (C = 0.883 g/L) and a piece of rGO/TiO2 NWs membrane with different catalyst loadings were added to the reactor. Magnetic stirrer (IKA-Werkw GmbH & Co.) at the bottom provided ideal mixing. Pure helium gas (99.995%) was fed into the reactor from cylinder in order to expel dissolved oxygen and nitrogen from the solution as well as to create an inert atmosphere right above the liquid phase. Helium flow rate was measured with rotameter (Omega FL-3861-C) and maintained at a constant flow rate to keep the pressure of the reactor at 124 kPa for 15 min. The photocatalytic reaction was started by switching on the UV lamp. Pressure inside the reactor was monitored continuously during the reaction. Gas chromatograph with barrier discharge ionization detector (GC/BID) was used for the analyses of H2, N2O, and N2. The gas concentrations were measured before switching on the UV lamp and during the irradiation. The gaseous samples were taken at each predetermined time intervals over 0 to 12 h’ span. During each sampling, 10 mL gaseous sample was withdrawn through the septum using a Hamilton gas-tight syringe through a septum and analyzed immediately on a gas chromatograph with barrier discharge ionization detector (GC-2010 Plus, Shimadzu). Blank reactions were also performed to ensure that the hydrogen production was due to the photodecomposition of ammonia. The first blank was in the dark with the photocatalyst and ammonia solution under the same experimental conditions, and the second was over the illuminated photocatalyst in the absence of ammonia (only in pure water). No hydrogen was detected in the above blank tests. The same piece of photocatalytic rGO/TiO2 NWs membrane was recycled by washing with DI water and drying in the air and tested again to exam the variation of photocatalytic hydrogen production performance. As demonstrated in earlier studies , colloidal GO particles can be assembled into macroscopic sheet structure by the vacuum filtration method. The following hydroiodic acid solution reduction process is proven effective in reducing GO to rGO with much improved electro-conductivity as we demonstrated earlier [35, 36]. The SEM image of the rGO membranes shown in Fig. 2 a displays smooth surface and tightly stacked layer structure. The SEM image in Fig. 2 b shows that the length of TiO2 NWs is about 1 ~ 3 μm with diameters in the range of 90~130 nm. The cross-sectional views of the rGO/TiO2 nanowire membrane in Fig. 2 (c) show that the TiO2 NWs are incorporated throughout the rGO membranes, and the interlayers of rGO are opened by the inserted nanowires which could enhance the permeability of the membrane . In the close-up cross-sectional image (Fig. 2d), the individual layers of the rGO/TiO2 NWs membrane are distinguishable, and the TiO2 NWs appear to be uniformly distributed between single rGO sheets. The GO colloidal suspension can be well mixed with TiO2 NWs without surfactants, forming stable colloidal solution, owing to the abundant oxygen-containing groups on GO and TiO2. The filtration fabrication process resulted in the uniform distribution of TiO2 NWs between the rGO sheets as shown in Fig. 2c, d. It is worth mentioning that in comparison to TiO2 spherical nanoparticles such as Evonik P25, TiO2 NWs facilitates better rGO membrane quality. The rGO/TiO2 NWs binary membrane shows improved tensile strength by approximately 30% , in contrast, the rGO/TiO2-P25 membrane disintegrates when immersed in water and aqueous solutions. The water permeability of the rGO/TiO2 NWs binary membrane is increased by 6- to 7-fold in comparison to pure rGO membrane. The porosity of the rGO/TiO2 NWs membrane was determined to be 11.7%. However, no meaningful micro- and mesoporous structures could be resolved by the nitrogen adsorption and desorption isotherms. There are two possibilities for explaining this outcome, namely, (a) the porous structures collapsed under the nitrogen pressurization and depressurization and (b) there are only macropores. In the photocatalytic experiment, when rGO/TiO2 NWs composite membrane, pure rGO membrane, and TiO2 NWs were immersed in the DI water in the reactor under the low-power (8 W) UV irradiation, there was no H2 gas production at all. This set of experiments suggest that rGO/TiO2 NWs composite membrane, pure rGO membrane, and TiO2 NWs are unable to perform water splitting under 8 W UV irradiation. In contrast, when DI water was swapped with ammonia solution (C = 0.883 g/L), rGO/TiO2 NWs composite membrane and TiO2 NWs showed photocatalytic activity for producing H2 gas, while pure rGO membrane did not show such a photocatalytic function. The photocatalytic hydrogen generation from aqueous ammonia in the presence of rGO/TiO2 membrane was observed over a period of 12 h. Comparison experiments were performed on the same amount (5 mg) of individual materials, namely TiO2 NWs andTiO2-P25, as well as rGO membrane. The amount of rGO was controlled by the volume of GO colloidal solution. The results of hydrogen yield of all investigated photocatalysts are shown in Fig. 3 a. Production of hydrogen can be found in all the TiO2-containing experiments under 12-h UV irradiation, while rGO alone did not produce any detectable H2 gas. It is striking to observe that the performance of rGO/TiO2 membrane in H2 generation improved significantly after being recycled. As shown in Fig. 3 a, the hydrogen production efficiency achieved by the rGO/TiO2 NWs photocatalytic membrane in cycle 1 is better than TiO2 NWs alone, and similar to the performance of TiO2-P25, producing 150 μmol/g·photocatalyst. However, in cycle 2, the hydrogen production in the presence of rGO/TiO2 membrane reached more than 2500 μmol/g·photocatalyst over 12-h period, which is 30-fold as high as that was produced by TiO2 NWs-only (80 μmol/g·photocatalyst), and more than 14 times higher than the efficiency of TiO2-P25 (176 μmol/g·photocatalyst). Overall, the hydrogen production efficiencies of all the tested photocatalysts follow the ranking of: rGO/TiO2 (cycle 2) > rGO/TiO2 (cycle 1) ≈ P25 > TiO2 NWs. Formulas (1) and (2) and their associated Gibbs free energy suggest that ammonia splitting requires much less energy input to occur compared with water splitting. Moreover, in the presence of O2, ammonia could spontaneously react with O2 and form N2O and gives off a large quantity of heat. This means the presence of ammonia helps drive the water splitting reaction by consuming O2, which could explain the observation that without ammonia there was no observable H2 production. On the other hand, under light irradiation, N2O could be decomposed into to N2 and O2 with catalyst facilitation as described by Formula (4). This reaction would impede the conversion rate of both water splitting and ammonia splitting. Therefore, monitoring N2 and N2O evolutions in the reaction system could offer insight of the reaction mechanisms. As shown in Fig. 3 b, the presence of rGO/TiO2 NWs photocatalytic membrane significantly promoted N2 evolution, suggesting successful NH3 splitting in the presence of rGO/TiO2 NWs composite membrane. Cycles 1 and 2 showed similar N2 production, reaching almost 8000 μmol/g·photocatalyst, that is about eight times of the production when TiO2 NWs were used alone (note: the N2 quantity measured at 6 h in cycle 1 appears to be an erroneous reading and is not considered in the discussion). It is also interesting to note that in terms of N2 production from splitting NH3, TiO2-P25 appeared to have no photocatalytic function to facilitate it, on the contrary, both pure rGO and TiO2 NWs showed some photocatalytic activity with that of TiO2 NWs slightly higher than pure rGO. This may be attributed to the difference in electrostatic charge of the catalytic sites on these different photocatalysts. As shown in Fig. 3 c, the N2O evolution is also drastically increased in the presence of rGO/TiO2 NWs photocatalytic membrane, while all the other photocatalysts did not show much activity in N2O evolution. This is consistent with the conclusion we drew so far that the water splitting reaction has been radically catalyzed by rGO/TiO2 NWs membrane in ammonia solution. However, intriguingly, the trends of N2O evolution in cycles 1 and 2 using rGO/TiO2 NWs photocatalytic membrane are distinctively different. In cycle 1, the N2O production catalyzed by rGO/TiO2 shows a steady increase over the 10-h UV irradiation, reaching 1800 μmol/g·photocatalyst. In contrast, in cycle 2, after 8 h, increment of N2O concentration is observed to reach a peak value of 1025 μmol/g·photocatalyst, followed by a rapid decrease, with 694 μmol/g·photocatalyst as the final reading at 12 h. This suggests that in the second phase of cycle 2, Reaction (4), namely N2O decomposition, has become more dominant in comparison to ammonia oxidation, Reaction (2). Overall, the photocatalytic reaction results show that rGO/TiO2 NWs membrane is a highly effective photocatalyst for converting ammonia aqueous solution to H2 and N2 with the concurrence of splitting H2O into H2 and O2. The presence of NH3 promotes water splitting, since NH3 is prone to be oxidized by O2, hence, driving Reaction (3). For the very same reason, it is also advisable not to use H2O as the storage solution for ammonia. Secondly, in this set of experiments, the difference in catalytic performance of rGO/TiO2 NWs membrane in cycles 1 and 2 is worth of attention; the drastically improved H2 production in cycle 2 suggests self-modification of the catalyst that is favorable for H2 production. Based on the results, we consider that during the first round of experiment, the aqueous ammonia may have induced a relatively weak nitrogen doping on the rGO/TiO2 NWs membrane that caused the following remarkable hydrogen production performance. To verify this hypothesis, X-ray photoelectron spectroscopy (XPS) was carried out to check if there is any nitrogen bonding on the rGO/TiO2. As shown in Figs. 4 and 2, 65% of nitrogen was detected from the recycled rGO/TiO2 NWs membrane, while the pristine rGO/TiO2 NWs membrane does not contain nitrogen (data not shown here). Two bonding states can be identified by performing peak split with the N1S spectrum. 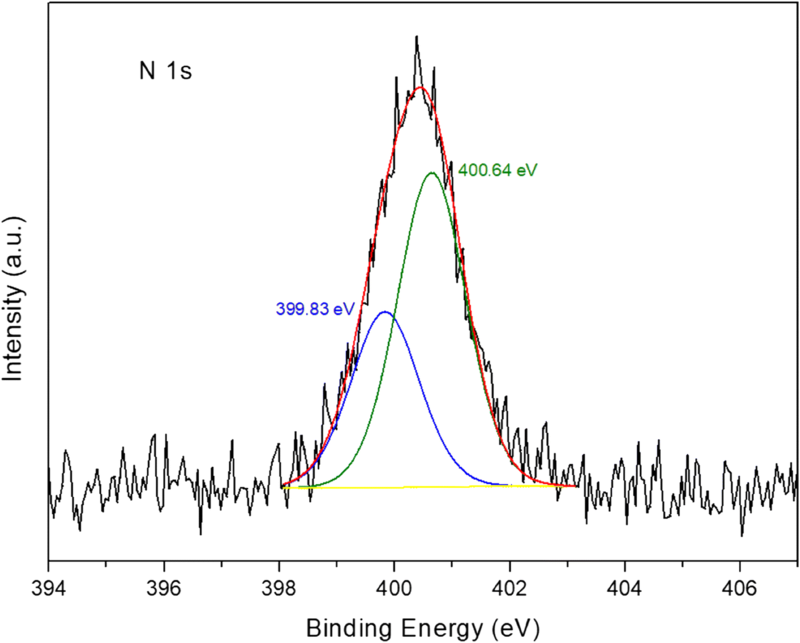 The stronger peak at 400.64 eV was attributed to imide group of pyrrolic nitrogen indicating the nitrogen doping on rGO sheets [27, 37, 38]; while the weaker peak at 399.83 eV could be attributed to anionic N in N-Ti-O . The absence of 396 eV peak shows no N-Ti bond was formed. The XPS data shows that weak nitrogen doping has taken place on the surface of both TiO2 NWs and rGO. The XPS results support the hypothesis that under the experimental condition, the aqueous ammonia can dope the rGO/TiO2 membrane and leads to significantly improved photocatalytic activity for both water splitting and N2O decomposition. Considering nitrogen doping into TiO2, GO or rGO usually requires thermal treatment, such a nitrogen self-doping of rGO/TiO2 at room temperature provides a new idea for nitrogen doping. The experiment showed that the TiO2 intercalated rGO membranes can be self-modified in the photocatalytic splitting of aqueous ammonia solution under 8 W 254 nm UV and result in nitrogen-doped TiO2 NWs and nitrogen-doped rGO composites. Such a nitrogen-doped rGO/ TiO2 NWs composite membrane has a hydrogen yield heightened by 30-fold compared with bare TiO2 NWs and 14-fold with bare TiO2-P25. In previous works, noble metals like platinum [3, 18, 39, 40, 41], palladium [3, 19], and gold [42, 43, 44] were employed to couple with TiO2, which only brought out limited enhancement of photocatalytic hydrogen production efficiency. For instance, six times improvement of H2 yield from ammonia solution was observed by using Pt/TiO2 photocatalyst in comparison to TiO2-P25 . It is also worth noting that the light source used in this study is a low-power (8 W) UV of 254 nm. It shows that the requirement on energy input for this new photocatalytic system to work is very low. In most photocatalytic H2 production studies, high-power light sources were used. For example, a 100-W Hg lamp was used by Kamegawa et al. and Lin et al. used 400-W halogen lamp as the light source to investigate the hydrogen generation from aqueous methanol solution. In comparison, our nitrogen-doping method is simple and green, albeit requires further detailed studies to unravel the mechanisms. The tremendously improved H2 production efficiency in the nitrogen-doped TiO2 NWs/nitrogen-doped rGO has previously been observed in photocatalytic water splitting . The improvement is attributed to several factors including (a) more efficient charge generation on N-TiO2, (b) faster transportation of photo-generated charge carriers, and (c) facile reduction of H+ on the active sites of nitrogen-doped rGOs. Importantly, the fabrication method of the nitrogen-doped TiO2 NWs/nitrogen-doped rGO composite membranes is facile and requires little energy inputs. Nitrogen doping introduced different electron states of nitrogen atoms and expanded the band gap of the material . The density of the charge carrier of graphene can also be increased; therefore, the stability and conductivity can be enhanced [29, 48]. In the hydrogen generation process described in this experiment, the N-doping of rGO may have resulted in improved electron transfer as demonstrated in the electrocatalysis works [49, 50, 51, 52]. The N-doping of the rGO/TiO2 NWs composite induced by photocatalytic reaction is serendipitous, though the exact reaction pathways of nitrogen incorporation from ammonia/ammonium into rGO and TiO2 are still under investigation. It is worth noting that the N-Ti-O bond has been reported to have caused significant increase of hydrogen production . Moreover, due to its unique membrane structure, the used membranes are very easy to recover from the reactor compared with conventional photocatalysts in powder form. rGO/TiO2 NWs photocatalytic membrane was synthesized and tested for photocatalytic hydrogen generation from aqueous ammonia solution under an 8-W UV light irradiation. The rGO/TiO2 NWs photocatalytic membranes showed significantly improved catalytic activity in promoting water splitting and ammonia splitting. Remarkably, the recycled rGO/TiO2 NWs membranes showed tremendous further improvement owing to nitrogen self-doping in rGO and TiO2 NWs during the catalytic reaction, where a maximum of 30-fold enhancement of photocatalytic H2 yield was observed from the rGO/TiO2 NWs sample compared with equal amount of TiO2 NWs; and 14-fold enhancement compared with commonly-used TiO2-P25. It is also observed that nitrogen self-doped rGO/TiO2 NWs membranes exhibit higher activity in decomposing N2O. This study shows that photocatalysis of ammonia aqueous solution induces multiple reactions in concurrence. Their interactions are complex, for example, the presence of ammonia appears to drive water splitting due to ammonia oxidation; and N2O decomposition could inhibit both water and ammonia splitting. Therefore, for extracting H2 from NH3 using photocatalysis, aqueous solution may not be the best option. Nevertheless, this study shows the feasible hydrogen extraction from ammonia-containing wastewater with a low-cost recyclable photocatalyst. It also provides a new route for doping nitrogen on rGO and TiO2. This study was financially supported by the Australian Research Council (ARC DP160104089) and the EU structural funding in Operational Programme Research, Development and Education, project No. CZ.02.1.01/0.0/0.0/16_019/0000853 “IET-ER”.